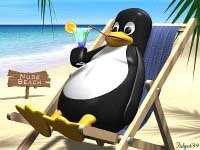 I had a long day at work today; over 12 hours and when I got home I grabbed some cold brews and sat myself down in front my Linux box to work on forgetting about today and preping myself for tomorrow. I popped in a music CD and fired up Xmms, fired up Aisle Riot for some solitaire, connected to the internet to get updated and the world was a beautiful place. OK, so yum is slow. I can live with slow. Polite people tell me I'm slow, less polite people call me a moron, others have different ways of describing me. But anyway, back to yum. I ran the simple (yeah, I get called simple too) "yum update" command. It kinda puked on a "checksums don't match" error on the metadata for my repositories. Then kept on searching for happy repositories. I let the darn thing run for about 15 minutes after I knew that it was yum that was hosed and not the repositories. No big deal. It was a running process, a simple ^C should have killed it and allowed me to fix this broken excuse for an updater. Nope. Didn't happen. I really thought that ^C was a real interrupt. Ok, so after a dozen or so ^C's I ran a "ps aux | grep yum" and kill the pid. Well that did work and a "yum clean all" unhosed yum and it went on to do its update thing. But, you know, I really liked apt. Smart looks like it has a lot of possibilities. Way back when the Red Carpet updater, I think it was a Ximian product, was pretty nice. SUSE managed to seriously damage their YaST2 updater in OpenSUSE 10.1 to the point that I passed that upgrade up and ordered SLED 10 for work. A good, reliable dependency resolving updater/installer is necessary if Linux is ever going to displace Windows. Why can't the community just pick one and make it work. Reliably and easily. And, for those point-n-clickers who are moving to Linux (not me!) a nice simple GUI thing to play with. OK, I'm done ranting. Besides I have to hit the 'fridge for some more cold brews. Of course yum and apt might also come with their own autoupdater script that goes in /etc/cron.daily.